You no longer have to count on one warm season to produce all your vegetables. You can grow food year round with some of the new advances in agricultural technology. Now you can enjoy a fresh salad and other fresh veggies during the coldest winter months. 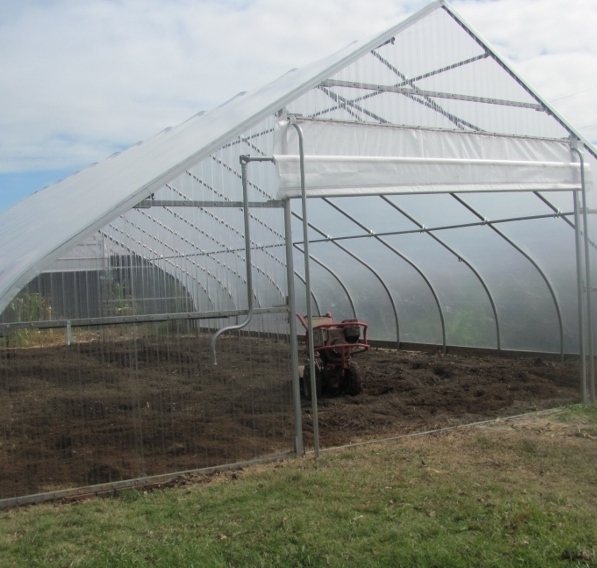 We have just installed a new 28’ x 48’ High tunnel here at Hoss Farms. We are located in Zone 8b (2012 USDA Plant Hardiness Zone Map) and therefore are able to grow most cole crops (Brussels sprout, cabbage, cauliflower, collards, kale, kohlrabi, mustard, broccoli, and turnips) throughout the winter. With the addition of the High tunnel, we are now able to grow these crops faster while alleviating the risk of tip burn as a result of low temperature anomalies. We tested the new Salanova® lettuce last year in our smaller greenhouse and was pleased with this new edition to our winter crops. We will start most seeds in our smaller, heated greenhouse using our heated germination mats and then transplant to the High tunnel. We have used a large amount of compost to build our soils in the High tunnel and the Hoss Wheel Hoe will keep the weeds down. We hope to enjoy fresh food all winter long.